In considering either the EU Services Directive or WTO rules on services, it is clear that the goal in each case is the same: the removal of obstacles to the free movement of services. However, a number of formidable forces – including the anti-globalisation movement, other civil society groups, and some EU Member States – have raised concerns regarding the effect of liberalization of services on the quality and availability of public services such as health care and education, and the compatibility of such liberalization with social policy objectives. Thus it is clear that the central question at both EU and WTO level is how to balance the proper functioning of the services market and the realization of general interest issues. how public interest issues are accommodated in WTO law. It is surprising that, as the services sector plays a major role in Europe’s economy, legal scholarship in this area is so sparse. This in-depth examination of tensions emerging between the goals of the European market and general interest objectives at the level of the Member States fills an important need for lawyers, policymakers, officials, and academics striving to clarify and formulate effective principles and rules in this important area of the European and global economies. Preface. 1. Prologue; van de Gronden. Part I. The Services Directive and the Free Movement of Services in the EU. 2. The Services Directive: Great Expectations? An Initial Overview of the Rights and Obligations of the Services Directive; S. Evans. 3. Free Movement of Services and the Services Directive: The Legitimacy of the Case Law; J. Snell. 4. Fundamental Rights and the Liberalization of Service Markets; S. Prechal. 5. The Effects of the Service Directive for Local and Regional Authorities; B. Hessel. 6. Service Directive and the Alleged Social Dumping: What are the Real Issues? F. Hendrickx. Part II. Services of General Economic Interest. 7. 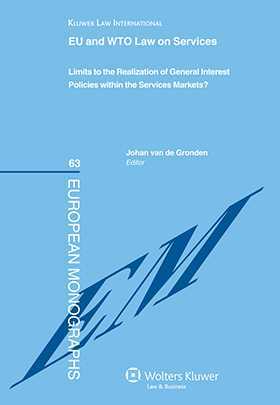 Services of General Interest in European Law: From Pure Ideology via Legal Insecurity to a Functional Guarantee? S. Wernicke. 8. Do We Need a Framework Directive for Services of General Economic Interest? S. de Vries. 9. The Increasing Influence of Primary EU Law on EU Public Procurement Law: Must a Concession to Provide Services of General Economic Interest be Tendered? H. Stergiou. Part III: WTO Law, Services and General Interest. 10. Services of General Interest and External Trade Policy; M. Krajewski. 11. Services and Public Policy Exceptions in WTO Law: The Example of the US-Gambling Case; D. Prévost. Part IV: Synthesis. 12. Concluding Remarks; J. van de Gronden.